Just north of San Fransisco, in Marin County, are some of my most favorite spots in the country. I had driven “by” this location many, many times over the years. But in 2015, I decided it was time to take the turn and explore Pointe Reyes a little more. 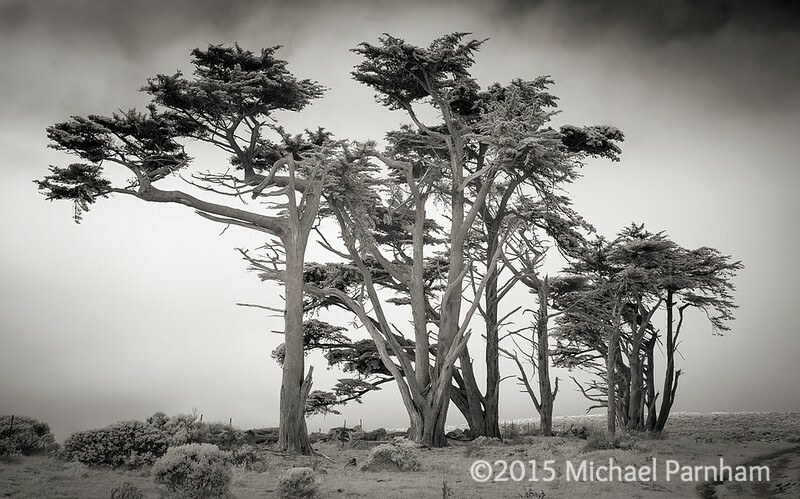 The road to Pointe Reyes can be a little hard to find, since it shows little fanfare. Just off of US Route 1, it’s outside the town of Point Reyes Station, where one of my favorite cheese companies, Cowgirl Creamery is located. Initially, you travel through tree covered canopy for quite some time. But eventually, the trees fall back. And oh, what wonderful landscape unfolds. The course takes you upwards into fields with occasional dairy cows, some providing Cowgirl with delicious cream, from what I am told. Looking East, way down below, is Tamales Bay, which provides the area with some of the most delectable oysters. I’ve seen a lot of amazing landscapes. But this one especially felt like a diamond in the rough. We’re only a few hours outside San Fransisco and we may as well be in the middle of nowhere. Lonely roads, wide open skies and distant landscapes– what an amazing place. The road meanders at this higher elevation, until you reach a dead end. And there, is the above stand of trees- bathed in a fog rolling off the Pacific. Hiking past those trees, you can get to Tomales Point, which overlooks the entrance to the Bay. I’ll be honest, I have not hiked to that point, yet… Sometimes I prefer to visit a location and leave some things unexplored, giving me an excuse to go back and explore further. 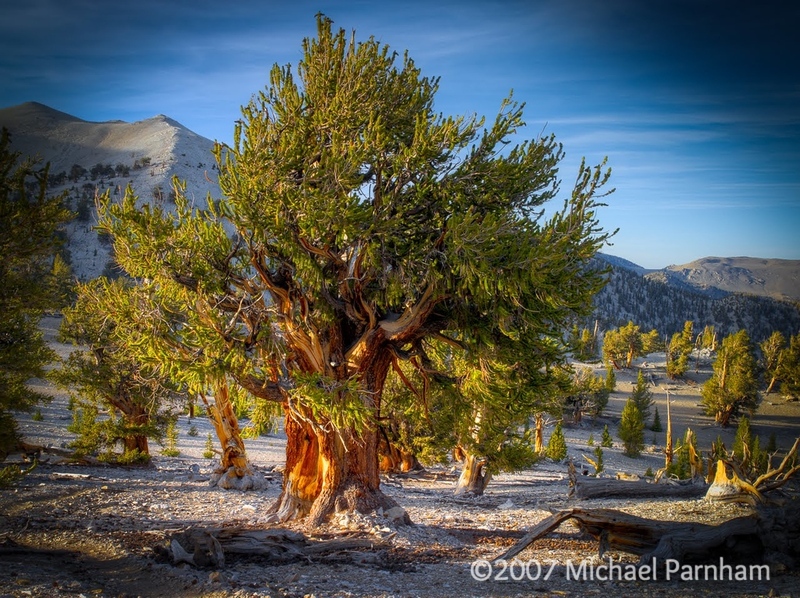 Just east of the Sierra Nevadas, lies an often overlooked range called the “White Mountains”. Maybe due to my home state, New Hampshire, which also has the “White Mountains”, I’m prone to gravitate to this range in nearly the complete opposite part of the country. I’ll cover more of this area in the future, since a lot of my portfolio is from the area. But today, I’d like to show off some shots from a truly magical location, eleven thousand feet up the range. 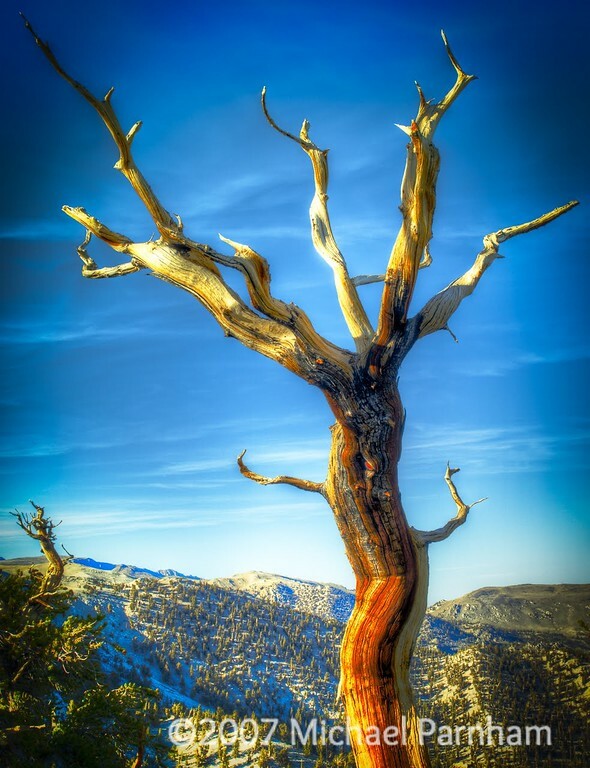 The bristlecone pine species is famous for having some of the oldest known living organisms on the planet. At least one, is over 5000 years old. The experts won’t tell us just where this tree lives. But it’s thought to be located somewhere in the White Mountain range. And that’s not all… An even older tree was actually cut down, kinda by accident, in the 1960’s. This episode of Radio Lab talks all about this. It’s a really fun listen. Go to 15:30 and check it out. The above shot was taken as the sun crept behind the larger mountain range to the west- the Sierra Nevadas. I love this shot. It’s one of my favorites blown up really large on canvas. At four feet wide, it still holds up wonderfully. And you can walk up and pick out the pine cones. I love how the tree trunk glows with oranges and yellows. And behind the tree, over the range, the sky is milky and pink, yet contained by deep blues. This shot also shows off the earth the trees thrive in- shards of dolomite and sparse soils. 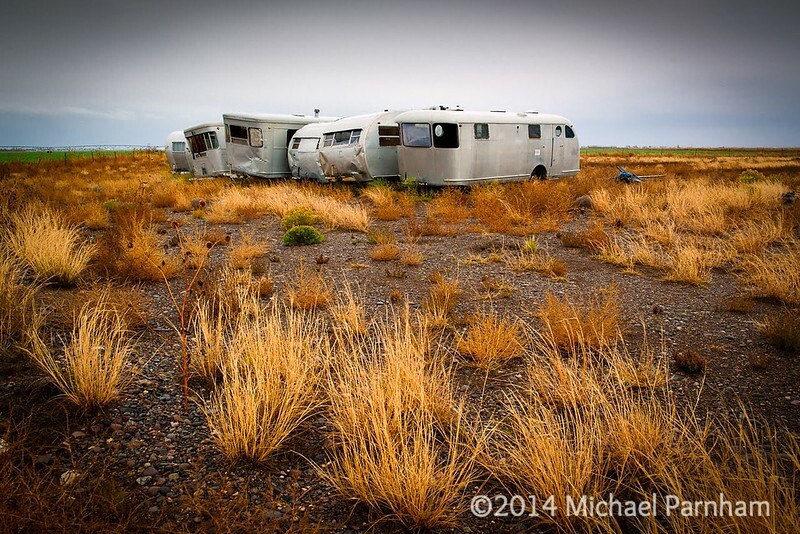 As a cold frozen rain and a driving wind whipped me about, I managed to sneak a few shots of these abandoned Airstreams. The sky was gray, but I knew if I shot via infrared, the sky would show details not normally seen with the naked eye. Someday, I’ll indulge you in talking about how this realization came about, some 20 years ago, shooting with a Nikon FM2 with good ‘ol Kodak HIE-2481, slogging through a late and dreary Utah fall. Nowadays, I’m shooting with a converted Nikon D800. The results are amazing, though I still miss the days of the latent image and developing in hotel bathrooms and youth hostel showers. And there it was- a second vehicle. An old pick up, barreling towards me. Roads and paths be damned, whoever was heading my way was doing it with sheer conviction. As the old pickup approached, it would dip down into a ditch, then jump out, becoming nearly air-born. No dust was stirred, for it was too wet. But old vegetation flew all about. These ditches turned out to be due to the fact that I was shooting in an old drive in- where they dug into the earth to allow cars to park lowered and angled up at the screen. I was, of course, not feeling too good about what I was getting myself into. The location was not marked as “No Trespassing”. But this was the west – and trespassing is treated differently in each state. Luckily, my burden became my salvation. I had cameras strapped all over me- a normal D800 and a D800 Infrared, along with a vest packed and puffed out with an array of lenses.. Yeah, I looked like a photographer, not a vandal. And that’s all the guy heading right at me needed to know. The driver seemed to have noticed all my gear as he approached- slowing down about 20 yards away. I opted to walk to him, cameras in hand, making it obvious I meant no harm to him or his property. I explained what I was up to. Just shooting those awesome Airstreams, nothing more. He cooled down, and we were soon talking about the guys trout farming enterprise. He was heading into town for more pipes. Crisis was adverted. 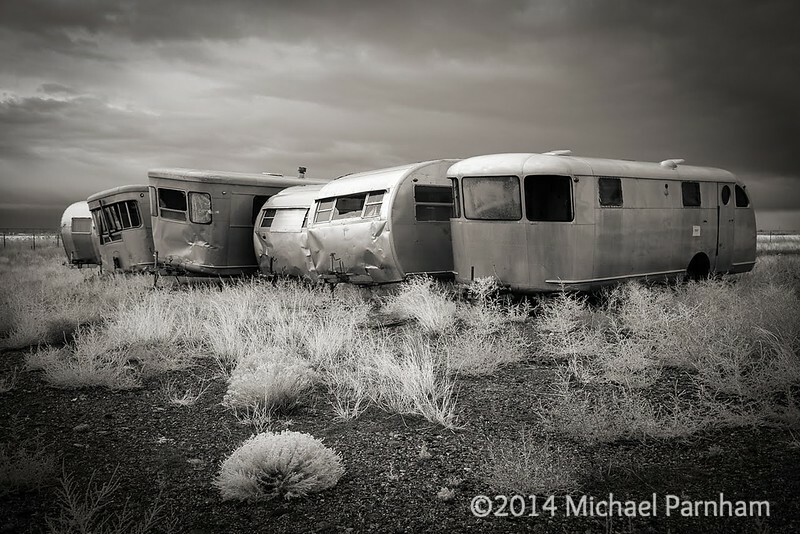 In the above shot, I love how the hazy-glow of the Airstreams brighten up the otherwise gray tone of the image. Infrared can often do those sorts of things, even during overcast conditions. It makes the Airstreams the star of the shot. Here’s a color exposure of the same scenario. Nice, but in the color version, it is so much more about the grasses. Sure, the shot is not cropped as tight. But I ended up doing that to tend to the intensity of the grasses- giving into the fact that the Airstreams are almost second fiddle. Some other things to notice.. Check out the difference in sky details between infrared and color exposures. Just amazing how the details just come out without any trouble. And that green bushy shrub- it’s the king of the foreground in the Infrared shot, lighting right up. Whereas in the color shot, the shrub is lost. We’ll talk about why this happened another day (I’m sure I’ll opine further about Infrared in the future, so hang in there). Finally, lets check out another shot from the location. I shot this after the property owner took off. This let me slow down and shoot a little more, pushing compositions further. I wanted to also talk about this shot, because I think it complements and contrasts the other two in so many ways. First off, the use of color here is pretty darn successful- far more than in the previous shot. 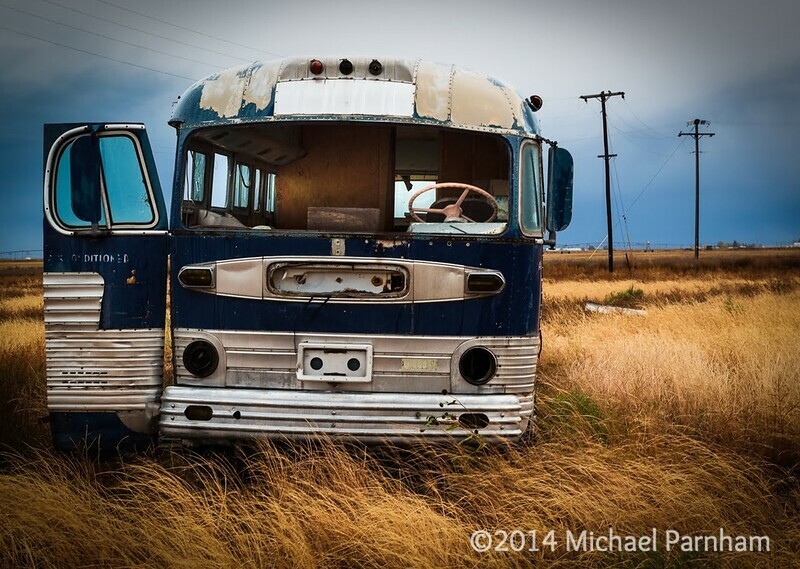 The blue of the sky, references the blue of the bus and then contrasts the sweeping wisps of golden grass. I don’t mind the sky being silken and lacking in detail- no need for the detailed sky of the Infrared shot. And the composition is actually more fitting of my oeuvre- I’ve stuck the bus over to the side, letting the background open up, and the electrical poles hold things together. And finally, inside the bus, the paneling and that pink steering wheel finish things off. 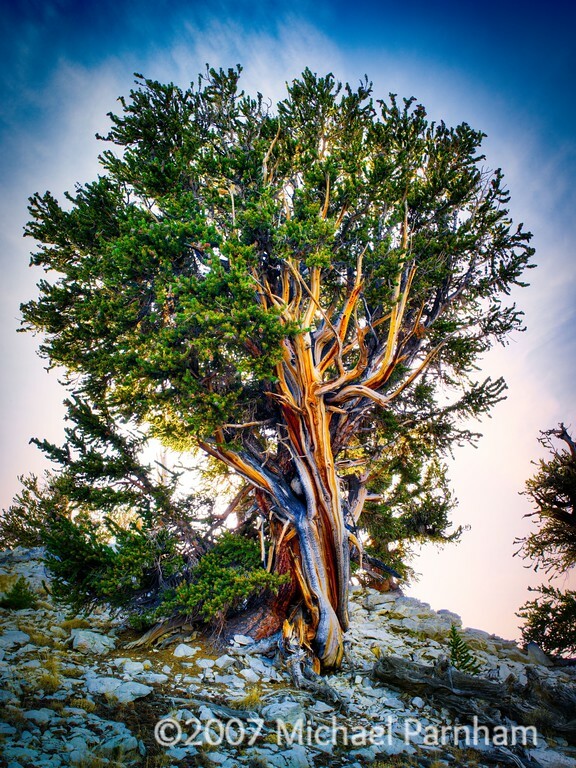 Next up, we’ll venture to the high elevations of Nevada’s White Mountains and ancient Bristlecone Pines. See you then. I’ve been up and down the west coast many times. And each time, I never come up short of finding amazing shots. In 2011, my (future) wife and I flew into Seattle and proceeded to drive Route 101, around the outskirts of the Olympic Peninsula. Prior, we took a ferry from downtown Seattle to Bainbridge Island. I had been on this route a number of times before, showing off how neat the ferry service was, she took it all in stride. Many times in the past, the coastal drive brought me days of solid rain. This time though, we were blessed with wonderfully expressionistic overcast skies. After camping a few days deep in the Queets Rainforest, we continued south down the Washington coast. We stopped and went for a walk along Ruby Beach. I took this opportunity to wander away from the main area- carefully walking along the narrow beach. To my back was a sea wall. While shooting in this spot, I knew that I could be trapped by the tide if I waited too long. But I couldn’t help it. I had to get the shot I was seeing in my head. Shooting with a Phase One P45 on a Hasselblad H2, I took multiple exposures. They were long, photographically speaking. Many shots were under 1/30 second. What I knew though, was that if i kept the camera position stable, I could take these exposures and combine (composite) them later into an amazing shot. The final shot shows wonderfully on Epson Exhibition Canvas, with a varnish of Breathing Color Timeless. I’ll talk about how I apply the varnish for my prints another time. The multiple slow exposures, then composited together into one shot, give a surreal, soft, almost creamy visual feel to the water. I love how the shadow of the rocks operates inside that area, and how the pebbles have their own micro representations of the larger scene. And being a fan of older photographic mediums (we’ll cover that more someday), I’m a sucker for warmer prints. In this case, that warmth worked out incredibly well. 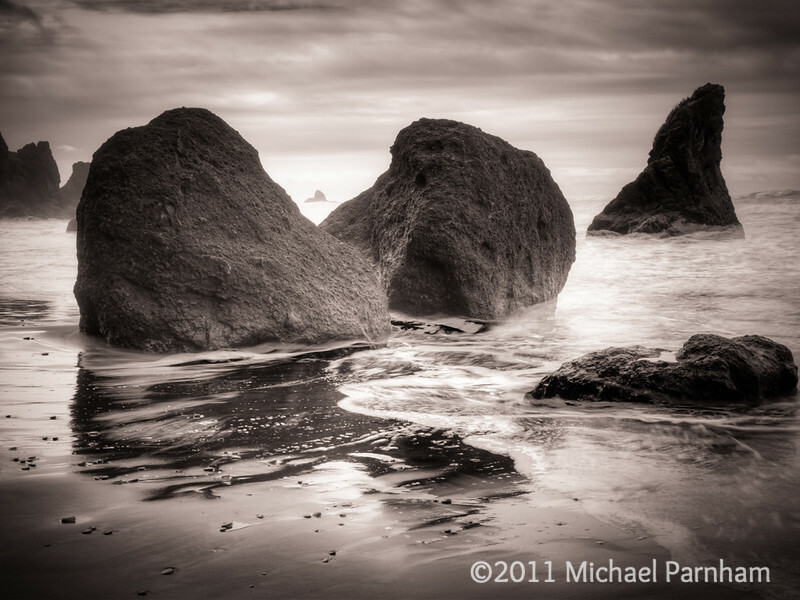 Here are some other shots from Ruby Beach, also shot during this visit. 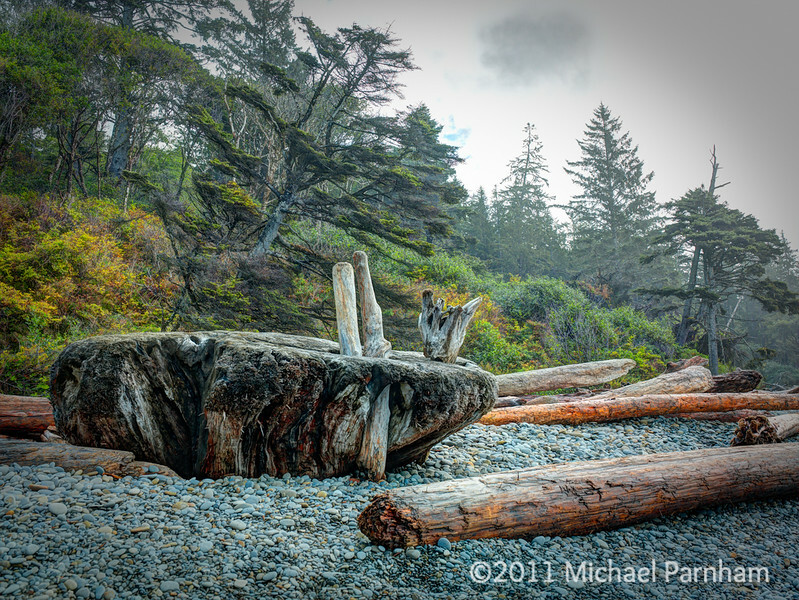 The northwest pacific coast is littered with washed up logs from old logging operations. I could shoot them all day. Stay away you swamp loggers… In the above shot, I love how the colors all work. We have the overcast/drab sky, foggy background and then the colors start to pop out in the mid range scrub. And then we have in the warmer foreground the logs placed within the more neutral/cold rocks. And these rocks have little color nods, the oranges, to the logs themselves. And of course, this shot has a bunch of diagonals- that can seldom hurt a composition. In this final shot, I wanted to again capture the dynamic skies, while also showing the relationship of the ocean, washed up logs and the living forest that comes right up to the beach. 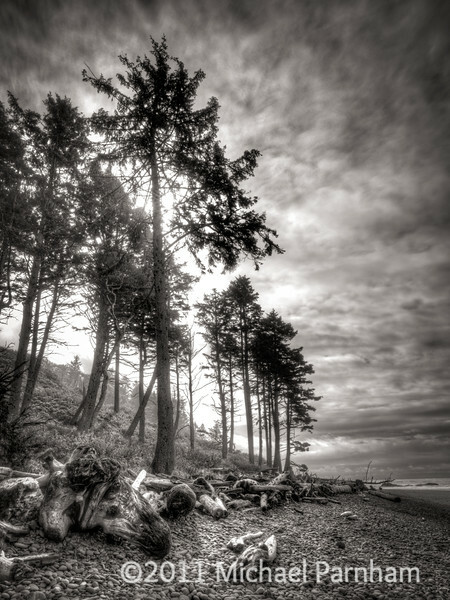 By using the multiple exposure-composite technique, I was able to capture the dwindling light, while preserving the deep shadows of the standing trees.